We received the notice the other day. It is time for Ryan’s triennial re-evaluation through our school district. He has undergone a battery of intellectual, psychological and motor tests to determine his ongoing eligibility for services as required by state law, and soon we will meet with our child study team to discuss the results. The first time we went through this process, we were afraid he would be declared ineligible for services. We no longer have that fear. The worst part about these evaluations is reading all the reports about your child’s abilities (or lack thereof). After a few pages and numerous references to results in the “low” or “low-average” range, I get numb to it. I know these reports do not change my child. The numbers on these pages do not define him. Sure, they’re a part of who he is and the struggles he faces. But they do not change the child that he is, the child that I love, any more than giving him the label “autism” does. I do feel compelled to point out that among all those “low-average” and “low” scores, Ryan managed a “superior” score in math reasoning, in which he tests at a college level. I am not criticizing the reports, nor the evaluators that prepared them. The child study team at our school is wonderful. They truly know Ryan and many of them have worked with him for years. The reports are detailed and painstakingly prepared, and they paint an altogether accurate portrait of our son. But not everywhere. In some areas, there are discrepancies between a low or average score and the extraordinary abilities that we have observed. For example, Ryan scored in the average range on one memory test. This is a child that committed the results of an entire 1,230 game NHL season to memory. That is not average. In those discrepancies, I find hope. Hope because I know that the reason Ryan scores poorly in some areas that are clearly a strength is that he has no interest or connection to the subject matter, and lacks the social or self-awareness to understand the importance of applying himself to the test anyway. He hurries through academic work and makes careless errors because the work is a chore to be endured since it does not capture his fascination. Yet he can spend hours typing NHL standings from memory — 30 teams, their wins, losses, and overtimes losses, and their goals for and against. Whether he’s typing the standings from a given date in an actual season that he has memorized or whether they are standings that he has simply made up, the numbers always add up correctly (the composite “goals for” are equal to the “goals against”). This gives me hope that one day he can find his niche in a field that captures his attention and interest and allows him to apply all his gifts and abilities. Maybe that field will involve hockey. Maybe he will have moved on to something else, but that’s hard to imagine given some of the observations in the report. I hope to … grow up to be an NHL announcer. I am best at … playing hockey. My favorite thing to do is … to watch hockey. The family has gone on many enjoyable trips to places like Boston, Philadelphia, Detroit, New York City and Long Island. Yep, all the vacation hotspots. Let’s see … Boston (for hockey), Philadelphia (hockey), Detroit (hockey), New York City (hockey) and Long Island (you guessed it – sorry no link as I haven’t written about these trips yet). We have gone to actual vacation spots, but I guess a week a Disney or on the beach just doesn’t carry the same weight in his world. My favorite place in the whole entire world is Canada. That is because hockey, a loud sport on ice lives there. My favorite sport, is hockey. It’s loud and is a place for fun. Their sports arena belong to hockey. People there go crazy over the stanley cup. I learned in this sport four years ago. I wish I loved it my whole life. I play it, it’s so good. I disagree. Canada is Ryan’s favorite place only because I’ve told him how in Canada, hockey is everyone’s favorite sport. To him, Canada is some sort of magical land where everyone is as interested in hockey as he is. In a week or so, we’ll gather with our child study team. We’ll discuss all the reports. We’ll hear that Ryan is still eligible for services. 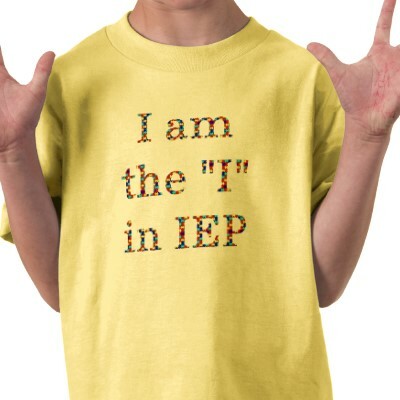 We’ll talk about his upcoming transition to a new school and begin framing his IEP for next year. There will be tears, and hugs, and a few laughs. Veronica will bring some sort of home-baked treat. Before we leave, I’ll argue that his detail sentences did support his topic sentence. But mostly, I’ll hope once again that all of this effort by all of these people who work with our son will lead him to a place in life where he fits. Where his interests and his abilities can mesh perfectly. Where the things that make Ryan Ryan can be assets and not hindrances. Where he can be happy. I think I am about to purchase a half dozen of those “I am the I” t-shirts…..thanks for the great post! Our 3 year is in May. Dreading it already. I can’t take any credit for the shirt picture. Turned up on a Google image search for ‘autism evaluation’. The site is http://www.myaspergerschild.com/ which I had not visited before, but looks like it’s chock full of good info. I can relate to reading those assessments. The first time we received one, I remember feeling like I’d been punched in the stomach when I read “Alexandra has a diagnosis of prematurity, which is likely to affect her development for many years.” It’s burned in my brain. Agree with your assessment of the Canada paragraph. I think the fact that he immediately gave hockey as his reason for loving Canada totally validates the connection. I guess these therapists aren’t always rocket scientists. But hey, sounds like Ryan might have the math skillz to be a rocket scientist. So there you go. I know you worry about the future. But I do see a promising life for Ryan. Probably not what we originally had in mind for him. I know that I currently have two brilliant men working with my company that are diagnosed with aspergers. They commented on the kids pictures and I had to brag. In the conversation Aspergers came up. Interesting reactions, but that is a long story. Both hold computer/math related positions. Yes they are a bit socially challenged and tend to focus their conversations different than other employees. However they make about three times my salary, providing invaluable security service to our country and seem to be very happy individuals that have found a place that values their unique skills and passion for what they do. Thanks for this reply. It is always encouraging to hear about individuals on the spectrum who have found their niche. And I also know that ALL parents worry about the future for ALL their kids. It’s part of the job description. Thanks as always for reading, for thoughtful comments, and for your continued efforts to understand and connect with Ryan. It is all very appreciated.